ARLINGTON, Va., Tuesday, Jan. 22, 2019—Members of the office of U.S. Sen. Tim Kaine (D-Va.) will join Arlington Democrats, Arlington Young Democrats, Indivisible Arlington, Virginia Democracy Forward and Arlington Democrats Blue Families on Friday, Jan. 25, for the second “Missing Paychecks Lunch & Protest.” This event, at St. George’s Episcopal Church in Virginia Square, is in solidarity with federal employees and contractors hurt by the #TrumpShutdown, which has entered its second month and is the longest federal government shutdown in history. Federal employees and contractors and their families and friends are invited for a free potluck lunch and update on the shutdown, including the Democratic response. Kaine’s personal appearance depends on the status of negotiations over the shutdown, but Mike Henry, his chief of staff, will attend. Furlough employees will also be encouraged to share their shutdown stories. About 75 gathered for Arlington Democrats’ first “feast for fearful, fed-up, furloughed feds” in mid-January. They heard from fellow furloughed workers and contractors, and U.S. Rep. Don Beyer (D-Va., 8th District). WHEN: Friday, Jan. 25, 2019, noon-1:30 p.m.
WHY: To show support for furloughed federal employees and contractors and to provide a safe space for sharing shutdown experiences. MISC: Those who can are welcomed to bring a dish to share. (Recommendations: People with last names beginning with A-I, bring side dishes, J-R, bring main dishes, and S-Z, bring desserts). Furloughed federal employees and contractors are invited as guests. Event partners for Friday’s events include: VA Democracy Forward, a grassroots group based in Northern Virginia whose mission is to restore and advance progressive Democratic values; Indivisible Arlington a chapter of the national grassroots movement devoted to resisting the Trump agenda by pressuring Republican members of Congress to vote against it and discouraging Democrats from going along with it; Arlington Young Democrats, a group of progressive and liberal individuals who provide an inclusive, growing, and empowering forum for all community members. 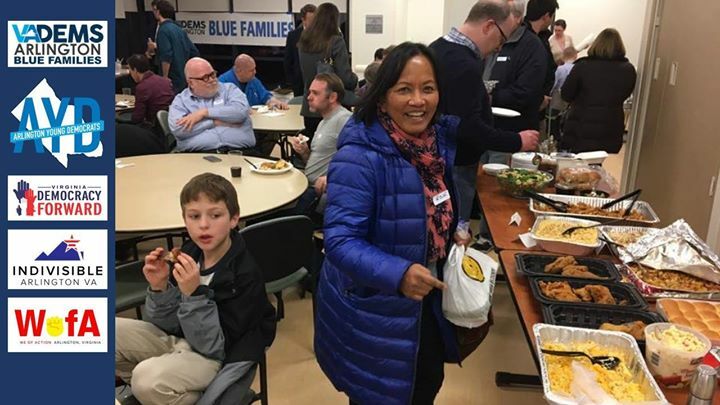 Arlington Democrats Blue Families is an initiative of the Arlington Democrats to encourage parents and their children to become involved in progressive political activism. About 800,000 federal workers and anywhere from hundreds of thousands to millions of federal contractors are now affected by the shutdown, according to The Washington Post. Nearly 10,000 federal employees and contractors filed for unemployment compensation earlier this month, according to Government Executive, a number that had grown 10-fold since the shutdown’s second week, and is expected to continue to rise. Scores of charities and businesses in the DMV are aiding furloughed workers with food banks, free meals, financial assistance and other support. The shutdown began Dec. 22, 2018, after Trump refused to sign legislation that would fund the federal government’s full operations—legislation he earlier agreed to ratify—unless Congress approves $5.7 billion in funding to begin constructing a massive wall on the country’s border with Mexico. Congressional Democrats have signaled their willingness to negotiate with Trump after the government re-opens. 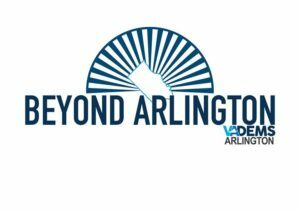 The Arlington County Democratic Committee (Arlington Democrats) is the official county organization for the Democratic Party of Virginia. 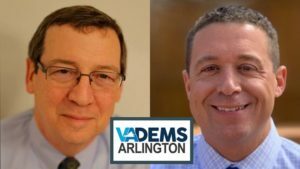 Arlington Democrats is open to anyone interested in advancing Democratic candidates, policy priorities and values in Arlington. Learn more at the Arlington Democrats website, and follow us on Facebook, Twitter and Instagram.